I didn’t need to be told twice as an AK-47 was pointed at my head through the open door. My wife in a panic and a speaker of eleven languages had understood what had been said in Kurdish and had already jumped out at the command. In the background, shots were being fired! I was confused but knew I had to follow her hasty exit. I jumped out and followed her to where the uniformed soldier was pointing with his AK for us to go. Shots being fired in the air helped me along, to move very, very fast. My wife and I have traveled all over the European continent over the last twelve years and this was our extended trip driving for three weeks around Turkey. We had already visited many exotic places, climbing to the top of Mount Nemrut to gaze at the pyramid structure and carved statues in honor of the King, who lived at the time of Jesus Christ’s birth. We had driven down to the bottom of Turkey at the border with Syria, observing the border guards at their station ready to shoot anyone who provoked them. We had driven along the Syrian Turkish border and stuck our toes in the Euphrates River, stopped to look at the refugee camps of the poor displaced people who had escaped the fighting in Syria. The most relaxing time was the two nights we spent sleeping in a rock cave in Cappadocia. We celebrated my 65th birthday with one of the most beautiful and fun balloon rides over and around the carved caves of the ancient people. My birthday treat was a gourmet, privately prepared meal by a great chef inside an exotic rock cave. I could write five thousand words on the other beautiful places we visited while in Turkey. To mention a few: the Black Sea Coast is a treasure, the old ruins of one of the most ancient cities, Ani, and its ruins is a must see for any adventurer, the oldest Christian church where the disciple Peter converted Paul in Antioch. The network of new dams and canals being built to turn the Southern desert into a blossoming vegetable garden shows the progressive and modern side of Turkey. My wife and I love to visit the places no one else travels and we found many old ruins and sites that had NO tourist information at all. We avoid the big modern cities. Even though Ankara and Istanbul are worthy of a visit, they are overrun with western stores and fast food joints. We prefer to crouch by an old stove and be served by a farmer’s wife. We drove East, home of the Kurdish people. We had gone through a total of eleven military check-points and we were used to having our passports and mobile phones at the ready. They always demanded to see my mobile phone and checked the photos to ensure we had not taken any of strategic border station points. The curious thing is they never asked to see my wife’s phone. We assumed that the Muslims thought women couldn’t take any photos. My wife had shot every single border point and tower she could see out the window with her phone. Driving north through an exotic industrial town named Batman and on into the Kurdish mountains, it was getting late and the sun was sinking fast. We had been warned to not drive through the Kurdish mountains at night as the so-called terrorists liked to take political prisoners and demand ransom and publicity for their cause. 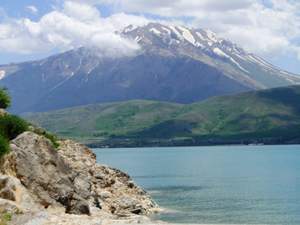 We were planning on finding a hotel in Bitlis and on our next day’s menu was a stop at Lake Van and on around the lake to Van to check out the ruins of the most recent earthquake, then to see Mount Ararat. We were following two large trucks on the winding road, our progress slowed further by the new construction down through the mountains, when they pulled to a stop. I drove to the edge of the road to try and see why we were stopping when a PKK soldier came alongside our rental car and, while pointing his gun at us ordered us, out of the car. We were herded to the new cement embankment and told to sit in a crouching position. On top of the embankment was draped a PKK flag, there were more soldiers with guns and a tall soldier walked along the edge of the road above us, screaming chants and ranting while simultaneously pointing his AK at us and then shooting in the air with warning shots. While being herded to the embankment, my wife had arrived first and a young Kurdish truck driver from the truck that had stopped just in front of us, ended up sitting between us. He was sweating bullets that scared my wife If this guy was scared, were we going to be killed? She wanted me to move around him and sit next to her. I whispered to her to just sit still and be silent. “Do not bring any attention to us as foreigners”. Two older guys were seated next to me. I dared to ask them to call the police for help on the mobile phone which one of them was holding. He stared back at me and didn’t say anything. I knew he understood my English from his whispers to his partner in which he used the words “English” and “police”. The tall man yelling and pointing his gun at us asked if there were any foreigners. The man next to me yelled out “American” and pointed at me. At the same time my wife, who understood first what the tall man yelling had asked, yelled out “Estonian”. The tall man laughed and walked on down the road, muttering, Estonian? What would we do with an Estonian? He did not hear the man who yelled American, lucky for me, as we had been warned they would take Americans hostage. After an hour, which seemed like forever with my legs killing me from having to sit in the crouching position, it had become very dark and all of a sudden the tall man instructed all of us to stand up and join him in singing and chanting their songs. We stood in the background and mouthed the words as best we could, trying not to be noticed. Then they just disappeared. It startled me as I looked around trying to see any of the soldiers, all of about thirty of them who had been wandering around were just gone! On shaky legs, we walked back to our car, that had been running the entire time with the doors open, and climbed in, all the time watching around us to make sure the soldiers had really gone away. I immediately grabbed my mobile phone, which was still laying on the console, and then realized that the mobile phone towers, whose lights we could see on the mountains above us, had been taken out and we had no phone service. The trucks, with us following, drove on down the mountain to Bitlis and finally we were able to call some friends back home in Tallinn and explain our ordeal. We were advised to contact the Embassy but we chose not to as they would just tell us to get out of this area and we still had so many places to visit. We were pensive and sleepless as we spent the night in a Kurdish-run hotel as we listened to the helicopters, military vehicles and police cars screaming by the rest of the night. The next day we drove back up into the mountains to examine the scene in the daylight. We found that a large cement truck that had bullet holes in it had caught fire and was completely burned out. Other than that there was nothing else to witness, no empty bullet casings at all. The police had done a thorough job of picking up all evidence of the Ambush. A world adventurer and traveler, who has intimately devoured over 56 countries, Craig Rawlings is a consummate serial entrepreneur, poet and writer and currently lives in Tallinn, Estonia. He has published many magazine articles and was Editor in Chief of an international business and economic magazine. A gourmet cook and spring chicken in the autumn of his life, Craig is seasoned just right.